Or, more specifically, for the ducks. A rubber duck race is a fun and unique fundraising idea. Not only will you raise some money, but everyone will have a great time. Use this fundraiser as an annual event that is almost sure to capture some attention from the local media. This will provide the added benefit of publicity for your organization. A rubber duck race is a good choice if you are looking for an annual fundraising event. While not something that you could do every month, it is the type of event that participants will look forward to over and over again. 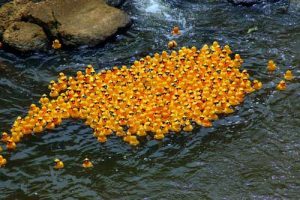 A duck race fundraiser does require a small investment as well as a time commitment, but the payoff will be well worth it, both financially and for the added publicity that is possible. Rubber ducks are “sold” to participants who then write their name and phone number on each duck they purchase. Be sure to use waterproof ink! Then, the ducks are placed on a river, pond or, as a last resort, in a large pool. The duck that reaches a predetermined finish line first is the winner, and the person who bought that duck wins a prize. Not just for bath time any more! few dozen ducks in order to determine the finish line. You don’t want to declare a finish line that is impossible for the ducks to reach on their own! Next, you will need to determine what the prize will be. Obviously, the larger the prize, the more participation you can expect. Often, local businesses will be happy to sponsor such a fundraising event by donating goods or services as a prize. Opting to have more than one winner (perhaps a first, second and third place winner) is another way to increase interest and therefore sales. Once a date, prizes and a location has been chosen, start to get the word out about the event. This is the type of fundraiser that will draw interest from entire communities. 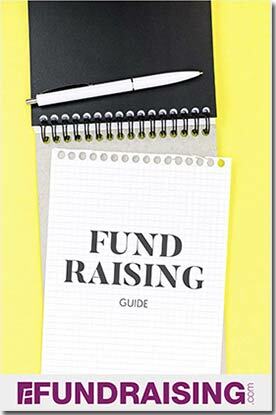 Some fundraisers may only get interest from people tied to the organization, but this fundraiser has the potential for much wider interest. The key is to get the word out. Use the local newspaper and radio stations. If your newspaper has a community section, you will probably be able to interest the editor in doing an advance story to help increase participation. Offer advance sales of ducks and allow people to purchase them right up until the event begins. Invite television stations to cover the start of the event, and make the atmosphere as festive as possible. You may even consider setting up food and beverage carts as a way to raise additional funds. The more you turn this fundraiser into an “event”, the more coverage you will get from local media and the more interest there will be in the event next year. A large quantity of rubber ducks. Call wholesalers and look online for the best prices on rubber ducks in bulk. Oriental Trading is a good place to start. The perfect location. Start scouting as soon as possible, so you will have plenty of time to obtain any necessary permits. Prizes. The bigger, the better. Local businesses need tax write-offs, so don’t be afraid to ask for their help. This fundraiser has the potential not only to raise a lot of money, but to be the talk of the town. And that will only help to increase sales next year!